There was a time when you just went to the post office to send a letter or to collect your pension/benefits. It can't have escaped many peoples notice however, that when you visit your local post office nowadays (if it hasn't been turned into a phone shop already), you're asked whether you'd be interested in Post Office broadband/insurance/mortgages and so on. When you politely decline you can visibly see the cashier diminish slightly, their bright smiles dipping to a despondant look of resignation. 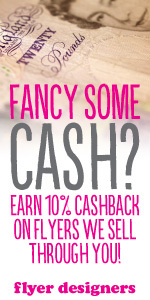 Welcome to the wonderful world of upselling! For those employees relying on the commission to meet their own monthly mortgage/rent payments, these 'rate our service' flyers below will probably not be particularly warmly welcomed or much of a surprise. 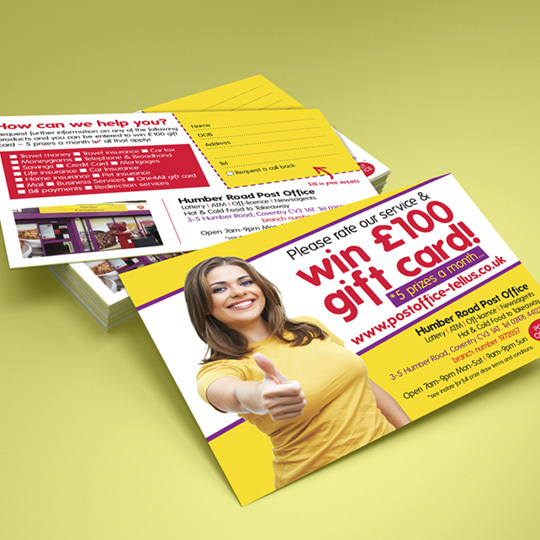 For customers, it's a chance to give feedback to the post office with the insentive of winning a £100 gift card. We've attempted to keep things jolly and upbeat with a smiling young lady encouraging participation with a friendly thumbs up. If you do give feedback to the post office don't forget to mention how lovely you thought our flyers were and we'll enter you into a monthly prize to win a hamper or something.